Joshua Tobias Bowman is an English actor. He rose to prominence for his role as Daniel Grayson (Main role) in TV series Revenge(2011-2015), for which he was nominated for Teen Choice Awards TV Breakout Star, Male. Josh Bowman dated a Canadian actress and his co-star Emily Van Camp from TV series Revenge since late 2011. They were engaged since 11 May 2017. On 15 December 2018, they got married in the Bahamas. Van Camp shared their wedding pictures on Instagram thanking all of the people who had made to celebrate with them and the team for a beautiful wedding gown. Not only that she shared the picture of Bowman from a honeymoon playing with a little cute dog. His role as Daniel Grayson in TV Series, Revenge. Bowman was born to Russian Jewish descent father and Irish English and distant Italian descent mother on 4 March 1988 in Berkshire, England. He went to Wellington College boarding school in Berkshire. He was a professional rugby player for a short time before he had his shoulder dislocated twice at the age of 18. Josh Bowman appeared as Dimitri in TV series Genie in the House in 2007 for the first time. As Daniel Grayson(2011-2015) in Revenge is the most successful achievement in his career, nominated for the Teen Choice Awards TV Breakout Star, Male. Then he appeared in the movie 13 Hrs, Prowl, Exteriors, Love's Kitchen, So Undercover, The Last Keepers Level Up, and Time After Time. Later he took part in two TV series Doctor Who(2018) and Lore (2018). 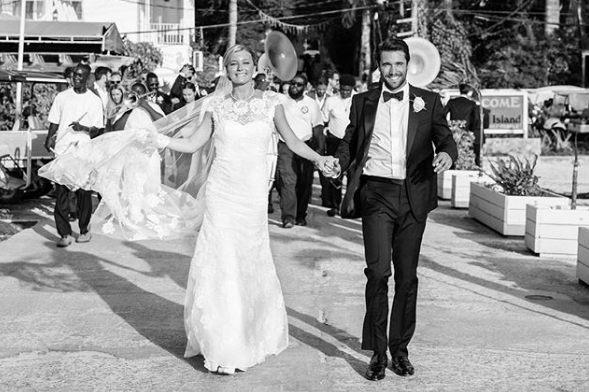 After being in a long relationship with the Canadian actress Emily Van Camp (Revenge co-star) since 2011 and engaged on 11 May 2017, Josh Bowman finally got married to her on 15 December 2018. His sister Scarlett Bowman is a former actress known for British TV Soap Opera, Hollyoaks(2011-2012) and The Cut(2009-2010). His athletic body structure has a height of 6'(1.83 m) and weighs 82 Kg (181 lbs). British actor Josh Bowman has a net worth of $3 million.